not on the side of the highway where they were stopping us. Yes to tourism in Canada! I am caught in the crunch between having a full live and trying to carve out just one more hour to write about it. That said, the ride back from Invermere, BC was everything a tourist in Canada could wish. 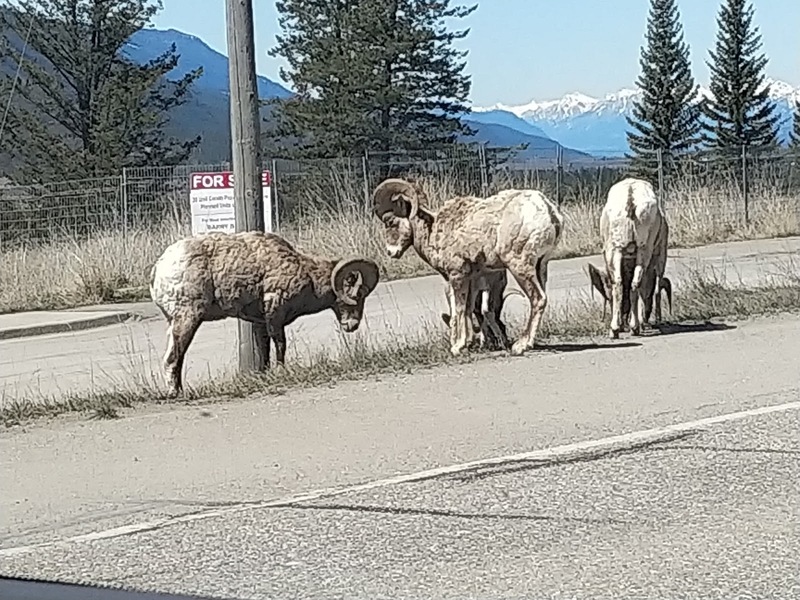 Mountain goats on the roads (who weren't moving over and thus we had time for pics), mule tailed deer in the fields, beautiful valleys, surrounded by the Kootenay Mountains, and a car full of gas ($1.50 a litre for those who are watching summer prices), and time to talk about being at the Secwepemc Spring Gathering. We finally have delivered Bonnie back to her home in Salmon Arm. We have been at my house for two days and she has dropped in both days. It has hard for the three of us to cut the ties that bind. Last night Moiya invited us to dinner. She said we could be "company". Growing up, our neighbours always had company and she had to go home when they came. Moiya asked our parents why they never had company. All we had was non-stop people coming for suppers. Thus we went to her house as company. Now I know company means Christmas dinner. Sirloin steak was what she said she was having. She didn't tell us about the butter-fried mushrooms, the dilled carrots, the cheese-sauced cauliflower, the baked potatoes with every topping in the world, and the pull apart cheese bread. Nor about 3 kinds of ice cream for dessert -- the best we have ever tasted. Now that is company. Today Rebecca and I are going to Vancouver. Rebecca and I are splitting up. She is going to a conference and I am going to the Museum of Anthropology on the UBC Campus. Again ... trying to choose between having a life and writing about one. Some will argue that they are not mutually incompatible, so what am I doing wrong?